Villagers will be aware of the increasing rush-hour road traffic flow through the village, especially during term times. The Parish Council has been working on possible traffic calming schemes to reduce and slow down the traffic travelling through the village and has now agreed a two-stage approach to deal with this important issue. First, a ‘build-out’ is scheduled to be built on the Bishopstone Road, close to the church, to restrict and slow down traffic. This has been funded through a generous donation from Pinewood School. Second, a part-time one-way system will be put in place for all road traffic in the village. Traffic will only enter the village from the Avenue and Lower Bourton and exit along the Bishopstone Road. To minimise the inconvenience to some of the villagers affected, the one-way system will only operate during term times. It will be important therefore for everyone to keep informed of term dates, which will be displayed prominently on the village and school websites. The first date of operation will be the start of the Summer term. Brilliant idea, but shame it couldn’t be a circular rotation with no exit……..! Do residents realise the massive implications of this? There will be no route out of the village towards the A420. This will result in an extra 2.5 miles for upper Bourton residents to access the A420 every journey, 24 hours a day, 7 days a week, for over half the year, to address a problem which occurs for only two predictable periods on Mon-Fri. Is this really the most proportionate and sensible solution? How about a happy/sad face speed indicator (I’m sure they have a proper name..), and/or access to Pinewood being signed to go around the village before the church, and approach along The Avenue? Surely more reasonable than dozens of villagers being hugely inconvenienced and driving many extra miles over the course of a year? Cars and lorries leaving Pinewood will also have no exit from the village other than past the church, and they will have priority at the build-out so will just speed out in that direction leading to a queue to get in! I feel that a change to traffic flow of such huge proportions requires village consultation and professional input. I cannot find any record of discussion or research leading to this decision. I’m actually stunned (and alarmed) to find out that the Parish Council have the power to impose such a huge change in the village without advice or village consultation and with about a fortnight’s notice. Please do correct me if I have misinterpreted the one way arrows on the map or there has been an opportunity for discussion which I have missed. I am rather concerned that should one not be aware of term dates, and may not be part of the village web and email network, that they might go against the ‘part-time’ one way system at the wrong point in the calendar. How would that stand legally and from an insurance perspective, should an accident occur? 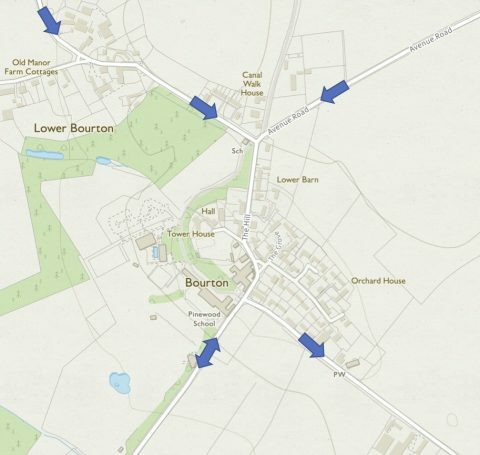 Also wouldn’t this actually increase the traffic through the top of the village as residents of lower Bourton will have no option but to go through the village to get out of Bourton, rather than just exiting via the Avenue or over the old bridge. I understand the need to square this rather difficult circle, and am fully behind the ‘pull-outs’ on the road, but aren’t we disadvantaging the actual villagers rather than the Pinewood traffic with a ‘Part-time’ system? I also appreciate the safety concerns which the Council are endeavouring to address. Wouldn’t it make more sense to have ‘No Entry-Village Access only’ or ‘time restricted assess’ at the bottom of The Hill and similar, with a ‘no left turn’, when exiting the school. This would have the effect of being permanent with no restrictions in lower Bourton to access the A420 via the old bridge or the Avenue and residents at the top of the village aren’t restricted in either access or direction. Signage could be position at the junction at either end of Bourton End to inform drivers of the restrictions. Pinewood only operates every other weekend and even on the ‘in’ Saturday it is only in the morning. This will only involve matches for Years 5 to 8 which is only half the school. A lot of those children board on Friday night and parents now also travel directly to away matches. It would make more sense just st to do weekdays. I am slightly surprised at the lack of consultation about this. There is no planning application registered to do this. Please advise on how it will be enforced? Very disappointed that such an important issue has not been discussed further with the people it affects. I would firstly like to thank the parish council for the time you have no doubt spent considering how to reduce the flow of traffic through our village. The traffic calming measure being taken by the church to restrict the traffic to one car at a time seems a very sensible approach and the new signposts directing traffic to Pinewood round the outside of the village are great. However we have serious concerns about part 2 of this scheme where the village will become one way during term time. This will make a considerable impact on our daily commuting time and fuel costs from September as we will both be commuting to Abingdon. It also has considerable environmental implications with the increased mileage incurred. We are disappointed that such a significant village change was not put out to consultation and no feedback was sought. We also feel that this will cause a much greater inconvenience to the villagers than the current heavy flow of traffic at two key points of the day. We would like to question why this extreme measure is being taken and ask why alternatives, such as a residents only sign, or one way during the key times (8-9am / 4-6pm) have not been considered. We would also like to enquire as to whether this is to be an enforceable system or one based on good will and whether villagers who decide to nip down the hill to half their journey to Sainsbury’s in the middle of the day will be penalised?! Really pleased with the build out scheme idea. We are, however not happy with the introduction of a one way scheme for residents as well. It make sense for parents coming to the school to circumvent the village and come along the Avenue when approaching the village, as this means they can legally drive at National Speed Limit the whole way to school rather than speeding past the church and subsequent properties. However making residents drive round the village seems extreme. As residents who live at the edge of the village, this means We will need to drive round the village and double back up The Hill to get to our property, actually causing more traffic through the centre of the village which seems ridiculous! Can we not have residents permits for villagers to allow us to come and go as we please?